The next beauty workshop that is going to happen in Tangs is Original and Mineral workshop. $80 to learn how to transform your hair with hair styling techniques. Door gifts and $80 voucher are given as usual. Metro is offering an Origins GWP, 4pc gift set worth $51 with $150 purchase. I don't have a photo of the GWP yet, will update if I could find more information. The beauty events now in US seem to be more exciting. Spend $125 on beauty at Nordstrom and you will receive a 13-pc beauty gift worth over $130, including a beautiful cosmetic bag and 12 deluxe samples. Top up another $25 to receive three more bonus Trish McEvoy deluxe samples and a bonus orange cosmetic pouch. Some beauty brands is offering GWP as well, check out the site for more info. Bergdorf Goodman is having Rewarding Beauty Event until 29th Jan. 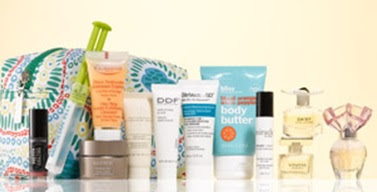 Spend $200 on beauty to receive a pretty cosmetic bag with 11 deluxe samples. Additionally there are over 40 brands offers GWP during this event. Just use code BTYBAG at checkout. Bobbi Brown offers three free deluxe samples with any purchase again. Offer until 19th Jan.
Dermstore offers 15% off all La Roche-Posay products till 22nd Jan.
Hautelook offer: Today they are having MOR Cosmetics, Antica Farmicista, and Zents Beauty sale events. Kiehl’s offer: Purchase any large-sized product and receive free shipping and free deluxe samples of Midnight Recovery Concentrate and Powerful-Strength Line Reducing Concentrate. Enter code BIGGER at checkout. Offer until 22nd Jan.
Neostrata offers five free Exuviance samples with $100 purchase. Samples include 30ml Rejuvenating Bionic Scrub, 10ml Heel Repair, 10ml Toning Neck Cream, 2ml Moisturizing Antibacterial Facial Cleanser, and 2ml SkinRise Bionic Tonic. QVC is offering free shipping and handling for over 500 beauty products. Good offer to buy the beauty samplers I mentioned in previous posts. Skinstore coupon: 15% off any purchase (some brands are excluded) until 30th Jan. Enter code 15JAN at checkout. Spalook coupon: 15% off any $65 purchase (some brands are excluded) until 30th Jan. Enter code JAN15 at checkout. ULTA Beauty offer: With any $30 Cargo purchase receive a free Cargo Most Wanted Kit ($50 value). No code needed just make sure you add the kit to your cart from the dropdown menu in the cart before you check out. While supplies last.